Many of our runners don’t know that the Chamblee Middle School Education Foundation is responsible for storing many of the course components for the Mud Run. But after each race, reusable obstacles need to be stored somewhere! The walls that our participants climb over are preserved under several tarps in the rear of CMS property. Hoses, netting, a pressure washer, signs – are all stored under porches or in garages and garden sheds by volunteers around Chamblee. But not anymore!! Morningstar Storage (3979 Buford Highway NE) stands at one end of a shopping center at the intersection of Buford Highway and Clairmont Road. This business are supporting the Chamblee Fun Mud Run by providing us FREE STORAGE for a YEAR! Once the 2019 race has been cleaned up, all of our supplies will have a new home in a big, climate-controlled storage unit in their beautiful facility. There are plenty of reasons for you to try out Morningstar, as well. They guarantee their prices for 12 months, and unit rentals are renewed on a month-to-month basis – no contracts! Morningstar offers a free truck for use on move-ins, business units, AND delivery acceptance. PLUS, if you need packing supplies, you can purchase them at 25% off at the rental office. The Chamblee Fun mud Run is thrilled to have Morningstar Storage as an Obstacle Sponsor for our race! Although many people have enjoyed the Chamblee Fun Mud Run over the past four years, not many people realize just how much help the Chamblee Middle School Education Foundation receives from the City of Chamblee. This year, Chamblee’s Special Events Coordinator, Brittney Lindsay, produced a video to promote the CFMR! Check it out! Tisa Moore, Chamblee’s Public Information Officer, made sure that the Mud Run received a full-page spread in the March 2019 issue. (See it here.) And Jodie Gilfillan, head of Chamblee’s Parks and Recreation Department helps us acquire Keswick Park and the Event Lawn for our Food Truck Night Event and the Mud Run. Her crew comes and does some heavy street cleaning to wash away all the mud that the Mud Run leaves behind! Lieutenant Roy Collar brings in officers from the Chamblee PD to keep traffic flowing on Food Truck Night and to guide the Mud Run along its course. Tom Hogan, Chamblee City Councilman (who created the Mud Run!) makes sure that the race gets the “okay” from City Council and helps liaison us with Peachtree DeKalb Airport for our mud disposal. Almost every area of the race is touched by someone in the City of Chamblee. We are beyond grateful to have such services provided to the Chamblee Fun Mud Run. While the CFMR prides itself on being run by parent volunteers, in truth, the professionals at the City of Chamblee are essential to the race’s success. We can’t do it without you, Chamblee! Thank you! Happy fifth anniversary to the Chamblee Fun Mud Run’s biggest supporter and Presenting Sponsor, Ed Voyles Automotive! In the past five years, Ed Voyles has given $50,000 to the Chamblee Fun Mud Run, and even more money to CMS through our Cluster Raffle. With a strong history of community involvement and charitable contributions, the Ed Voyles Automotive Group partners not only with Chamblee Middle School, but with Marietta City and Cobb County Schools, as well as other schools in the Chamblee Cluster. In addition, they are annual partners in the major fundraising efforts of the United Way, the March of Dimes, the American Red Cross and MUST Ministries. 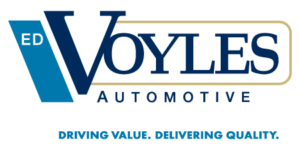 We commend Ed Voyles Automotive Group for they strong community commitment, and thank them for their continued support of the Chamblee Fun Mud Run and the Chamblee Middle School Education Foundation!